I think I’m just perpetually late for any and everything, including Jenn’s Time Warp Tuesday! 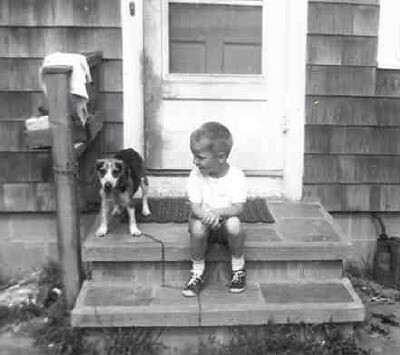 This is a shot of my brother Larry, on the back step of Auntie Rosa & Uncle Jim’s house down the cape. LOVED this place, spent many, many long hours there. I can still close my eyes and smell the ocean (an easy walk away), I can hear the laughter, I can taste the blackberries that grew in the back yard, and I can remember getting yelled at by Aunt Cyn one day. I took one of Auntie Rosa’s good silver spoons and began digging a hole…to China. What? Oh, and the beagle in the picture is Baby, she was joined in the household by a beautiful German Shepherd, Lorelie. Loved those dogs! That’s a great memory. My BFF’s brother dug a hole to China. He got about 4 feet down. What a great picture! And right above Baby and Larry was my bedroom! I feel like I would visit an art gallery with the story next to the snapshot. I can almost smell the ocean!